After my 4×4 ride back to the road, I crossed the street to the bus stop bench where I saw one other person waiting. I wanted to make sure I was at the right place so I asked, in Spanish, if he was waiting for a bus to take him west. In English he told me yes. I should clarify, he answered in American English! I had been in Uruguay nearly one week and this was the first American I met. Being that I had just been a little homesick it was nice to hear an American accent. We introduced ourselves — he was from Colorado and finishing up three months of travel in South America before heading home in a few days. I told him he was the first American that I met since I arrived in Uruguay nearly a week ago. He did not seem surprised. We chatted about South America and traveling and why we each chose to explore the continent solo. He had worked his was from the north to finish up in the south while I would be heading south to north. He told me that depending on where I wound up, I’d hit parts of the backpacker trail. I mentioned that after Colonia, most of Uruguay seemed to be off the beaten path. He laughed and then told me that where we currently were, was off the radar and we weren’t even on a path, much less the backpacker one! Let me back up a second. Part of my intentions of traveling off the beaten path was to meet locals, not Americans, but after my personal pity party for one earlier in the day, it felt so nice to talk in English without worrying about double meanings or how to explain something in Spanish. We could just talk. And talk we did — for almost an hour. (Good thing I got the fluent English out of my system because it would be another week until I would be speaking English to native English speakers again). We chatted until the bus arrived and we happened to have bus tickets with seat numbers assigned next to each other so we continued to chat. We talked about the guard versus co-pilot on the buses, the obsession with mate and assigned seats are serious business here. We spoke in English until I had to get off the bus in Rocha to buy my connecting ticket. We bid adieu. 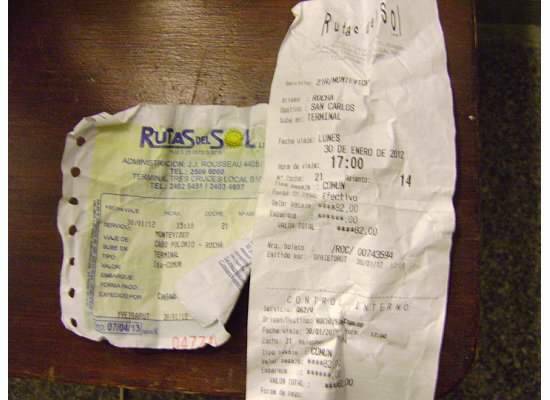 I grabbed my bags from the belly of the bus so I could sort out my onward bus ticket to Minas. This entry was posted on Wednesday, January 16th, 2013 at 8:00 am	and tagged with uruguay and posted in bus travel. You can follow any responses to this entry through the RSS 2.0 feed.